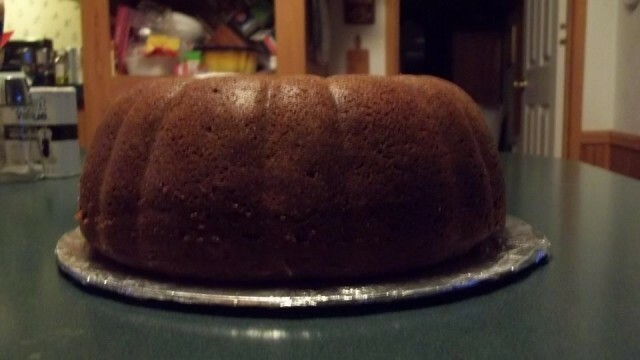 This Double Chocolate Pound Cake recipe was submitted into the Cooking with QuiBids recipe contest by QuiBidder Chris B.
Preheat oven to 350° (325 if your oven cooks fast). Grease and flour (Baker’s Joy) a 10-cup Bundt pan or 13 × 9 brownie pan. In a large bowl, combine cake mix, pudding mix, and sugar. Add water, oil, and eggs. Beat with an electric mixer at medium speed until smooth. Stir in sour cream and mini chocolate morsels. Pour batter into prepared pan and bake for 1 hour, or until a wooden pick inserted in center comes out clean. Let cool in pan for 10 minutes. Remove from pan and let cool on a wire rack. Sprinkle with confectioners’ sugar, if desired. Keep Warm with these 7 Crock Pot Hot Chocolate Recipes.